Did you know you can laugh without a sense of humour? You can even laugh when you are not feeling happy. Laughter triggers the release of endorphins- the body’s natural pain killer. Laughter exercises the diaphragm, heart and lungs. Laughter strengthens the immune system by raising levels of infection fighting T-cells. Laughter provides an aerobic workout for mind body and spirit. In today's fast paced and demanding world many people can feel stressed and overwhelmed. It's an increasing reason that people visit their doctors. It's not so much the stress itself, which can make us unwell; it's more the volume of stress, our reaction to it and how we manage it. By reducing our stress levels we empower ourselves to take action for positive change. This gives us back the ability to approach our life in a more resourceful way. Laughter is therapeutic and a great antidote to stress. It has many scientifically benefits for our mind, body and spirit many scientifically proven benefits. It creates an immediate shift in our body's physiology and produces a general sense of well-being and encourages positive thinking. Did you know that babies and young children can laugh over 300 times a day? As children our laughter is mainly joyous (right brain), as we grow up we laugh less and it becomes more intellectual (left brain). As adults we tend to laugh through humour and are lucky if we laugh 12 times a day. George Bernard Shaw tells us “We don’t stop playing because we get old. We get old because we stop playing”. My aim is to help people create positive benefits for their mind, body and spirit. I run laughter yoga sessions as a positive and fun way for employees and individuals to improve their well-being and reap the benefits of laughter. These sessions combine playful exercises with gentle stretching and yogic breathing and end in a relaxation. Each session is adapted according to the participants. 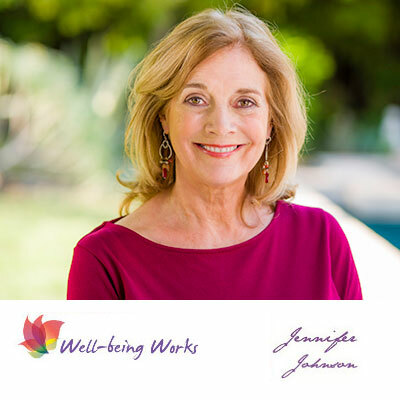 I also offer One to One Laughter Coaching for people who either may prefer to work on a one to one basis, or who may be physically challenged, or have a chronic disease. I have attended quite a few of Jennifer's laughter yoga workout sessions, which have been uplifting and beneficial. She adapts the sessions to the people she is expecting.